WIP Wednesday (28/09/11): Happy things. Now that the lurgy is lifting, the long list of 'makes' is calling again and I've been busy for the last few evenings. After yesterday's realisation that I really would never have enough time or patience (or yarn!) to make a Beekeeper's QUILT, and all the helpful comments, I tried the hexipuffs out as a Beekeeper's Benchpad and think this could be a very good option for them. Especially as it's the first thing one sees on entering - so the hours of work would at least be seen. 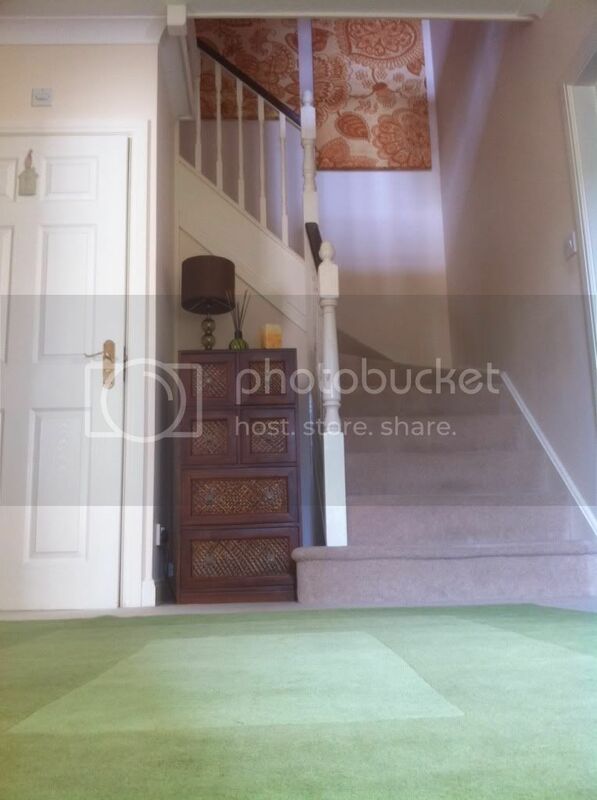 Only one problem - our hallway is shades of green, cream and dark wood. No pink or purple in sight. And in case you didn't already know this about me, everything must be matchy-matchy.... so the next step will be to get some more yarn and make up some new 'puffs for this purpose and as it'll be used to sit on rather than snuggled under, I may use more 4 ply wool as the puffs are that bit sturdier and fatter. And then to use the pinks and purples I've already made for (an)other small project(s) .... maybe a cushion for Little Miss as was suggested by Stocki. Having come to this decision I'll admit to feeling quite excited that this could be a FO in a matter of weeks or months, rather than another year or so. You may recall that last Wednesday I was debating what to do about the jumper I'd cast on. Well thanks to all your words of wisdom I decided to follow my instinct and frog it. Another decision I feel very happy with. And so onto the third and forth WIPs and a first for me - crochet garments! So far it's been blankets, cushions and flowers but no crochet clothing so I was delighted to find a suitably easy pattern to give it a whirl. I started with some Marble DK (discovered in the cupboard - I didn't know I had and don't know where it came from!?!) in case it didn't work out, but I like it! It should be finished imminently and will then be heading off to a friend. Of course Little Miss placed an order for a bigger one, so when she was in bed this one was started and I am in LOVE with these colours which remind me of our first ever woven (babywearing) wrap - Didymos Eva. It's amazing how quickly this is working up. Enjoy your Wednesday, and remember there'll be more WIPs at Tami's throughout the day. I'm a big fan of Marble yarn. I know it's cheap, but it's so soft and lovely and the colour range is nice too. I'm currently knitting a scarf and a cardigan from it. The little top is so adorable!! and love your colour choices for the second one! Cute garments :) Crochet is so much quicker, but I've only made one thing so far so I might wait a while before attempting actual clothing! Wow you've been busy! I love the crochet tops, they are gorgeous. Your hexapuffs are great too, I think a bench topper is great, can't wait to see the FO. I love the little crochet tops, so sweet! I think you made the right decision with your hexipuffs, can't wait to see it all finished! I love the progress of your bee keper's quilt.. keep going.. you'll end up with a gorgeous FO. Everything looks great! Maybe you can mix a few blue and pink puffs in with the green, cream and brown ones. They would look so nice. My Knitting group is getting ready to start a hexipuffs swap. I will love seeing how you beekeepers progresses. I can't wait to see the bench cover. I would have just used the colors you have, but then, I can't stand lines that aren't straight, so I understand it would have driven you crazy. Love the tops, Little Miss will love it too. I think the BeeKeeper's Quilt might be best as a swap or group project or something like that. I'd like one like a charm quilt with every single hexapuff different, but I certainly don't have the yarn for that! Your feedback is very helpful; I found myself nodding in agreement as I read. Cute tops for the girls, but surely not straight to snow after Indian Summer?! I love your blog and it is a staple in my google reader. I just wanted to let you know I've nominated you for The Versatile Blogger Award! The dress is gorgeous, I love the colour's you've chosen for the second. What an excellent idea for your bench! I would never have enough patience for a bed sized blanket! i love the crochet tops !! Been studying your hexipuffs and the colours. I think they are great. Don't be tempted to dilute those lovely strong colours. The hexipuff benchpad will be fantastic - they look great on there but I agree they do need to match in with the colour scheme. 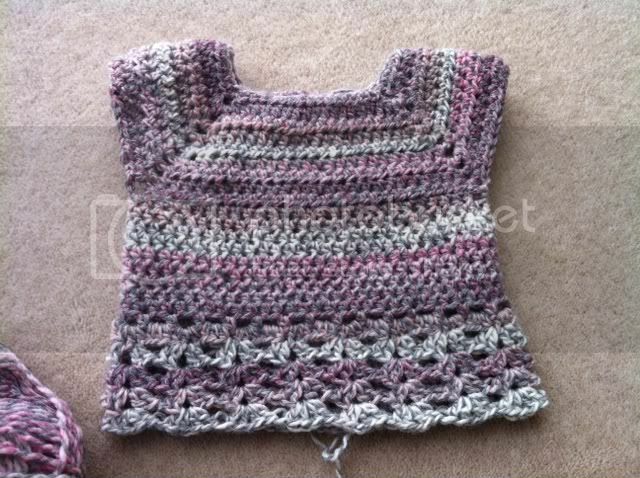 Thank you for the link to the crochet top - another one added to my ravelry queue!!! Using the hexipuffs as a benchpad is brilliance! :) It'll look amazing when it's done. Those are super cute tops. And I think your bench pad would be very beautiful and doesn't need to be perfectly matchy matchy. I love seeing someone else working on numerous projects all at the same time, right now I'm working on 4, but I love that top so much I think I'm going to start one of those too! That sounds like a great way to use hexipuffs. I love the fact you're using the puffs for other projects rather than a gigantic blanket. 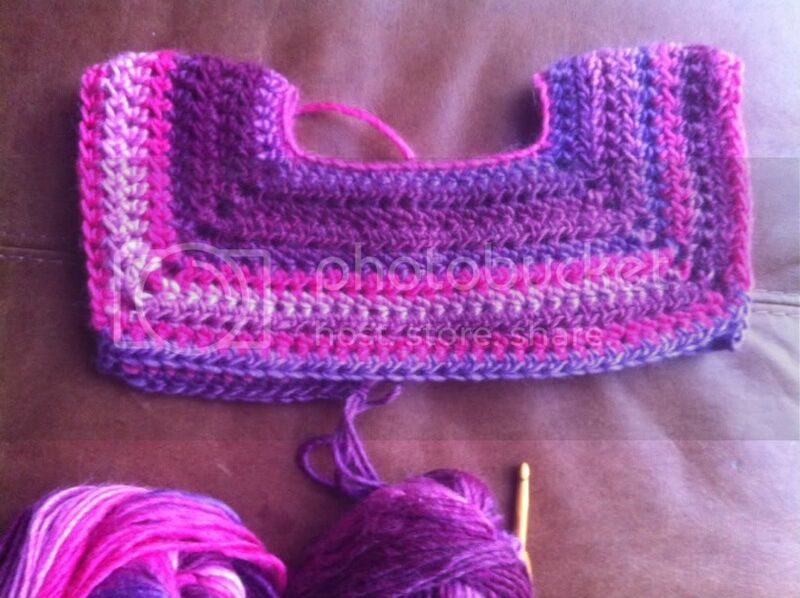 I'm in love with that purple and pink yarn. I know that a pink Christmas Tree might not be everybody's cup of tea (it would go down a storm in my house mind you) but a creative use of extra hexipuffs nevertheless! I love the idea of a beekeepers benchpad! And yay to your explorations with crochet garments. That's a perfect use for your puffs! What a great & clever idea!